This Spring, the Boise Timbers|Thorns will be providing an array of programs and camps designed specifically for younger soccer players. 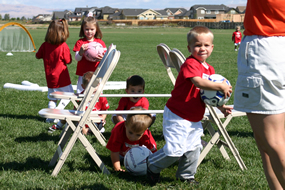 Each program is designed to provide age-appropriate training for specific age groups. Note: Age Groups are defined differently for Recreational Programs vs Competitve Programs. Please make sure that you select your child's proper age group when registering. Using the tables above, please determine which program(s) are appropriate for your child's age, and then read the program descriptions below for registration/information. The BTT Youth League is more than just a soccer league. 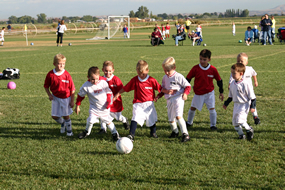 It is a school with a standardized curriculum for developing young soccer players. 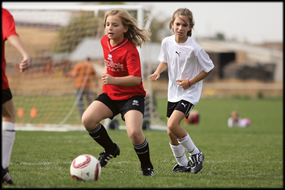 When children are taught advanced soccer skills at an early age, they become more confident players as they grow older. And most importantly, they enjoy playing the game more. The BTT Juniors Academy is designed for players with previous recreational experience who want a more soccer-intensive level of education and play. This program will be limited to a set number of players in order to ensure a quality year-round programming environment. The BTT Tots Program introduces children to physical activities with and without a ball that will help the development of coordination, agility and balance. The BTT Competive Program is designed for advanced players looking for competitive soccer environment. Tryouts for this program typically occur during the first week of June, but can be arranged for other times as required.